The play "Hirakana Seisuiki" was originally written for the puppet theater (Bunraku) and staged for the first time in the 4th lunar month of 1739 in Ôsaka at the Takemotoza. It was adapted for Kabuki the following month and staged for the first time in the 5th lunar month of 1739 in Kyôto at the Minamigawa no Shibai, produced by Mizuki Tatsunosuke II for the nadai Hoteiya Umenojô [casting]. Then, the play "Hirakana Seisuiki" was performed for the first time in Ôsaka in the 9th lunar month of 1740: it was produced at the Kado no Shibai by Nakamura Jûzô I and the only know actor in the casting was Nakamura Tomijûrô I in the role of Chidori. This play was staged for the first time in Edo in the 7th lunar month of 1753, at the Ichimuraza [casting]. The play "Hirakana Seisuiki" is made up of 5 acts. "Ôtsu Yadoya" and "Sasabiki" are the opening and second scenes of the third act, which ends with the famous "Sakaro" scene. Most of the times, "Sakaro" is staged alone. On rare occasions, the "Ôtsu Yadoya" and "Sasabiki" scenes are also produced along with "Sakaro". Yamabuki Gozen, wife of Yoshinaka, a defeated general, stays at an inn at Ôtsu on her fugitive journey, accompanied by her infant son, Komawakamaru, her favorite maid, Ofude, and Ofude's father, Kamata Haito. Hearing Komawakamaru's cry, an old man staying in the next room shows the child a picture to distract him. The old man is a boatman named Gonshirô living at Fukushima in Ôsaka. He is on a pilgrimage together with his daughter, Oyoshi, and her little boy, Tsuchimatsu, who is about the same age as Komawakamaru. After all have gone to bed, Komawakamaru and Tsuchimatsu leave their beds and play together with a paper lantern lighting their rooms. Accidentally they knock over the lantern and the light goes out. Just at this moment, Banba no Chûta and his troops attack the inn intent on assassinating Komawakamaru. All those staying at the inn rush away in panic and in the confusion and the dark Komawakamaru and Tsuchimatsu are inadvertently interchanged by their respective relatives. The assailants pursue Yamabuki Gozen and her party in a bamboo thicket behind the inn. In Yamabuki Gozen's arms is a child whom she believes to be her own son, Komawakamaru, but who is actually Tsuchimatsu, the boatman's grandson. 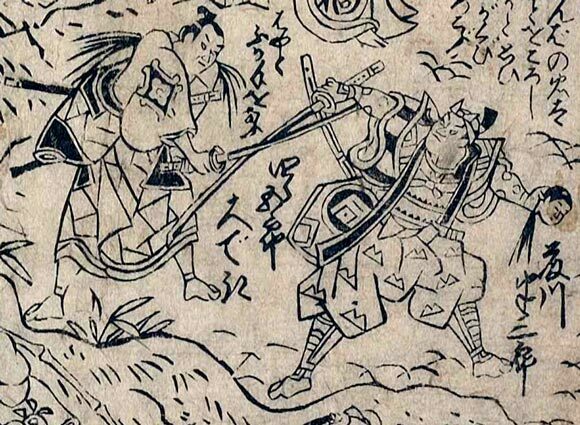 Ofude draws her sword and fights off the attackers. After she has gone pursuing them, Chûta appears and kills Haito, knocks Yamabuki Gozen unconscious and beheads the boy. No sooner has Chûta gone, carrying the boy's severed head with him, Ofude comes back, and, inspecting the headless body of the murdered boy, discerns that he is not Komawakamaru but the boatman's grandson who had been staying in the next room at the inn. To inform Yamabuki Gozen of the boy's identity, Ofude approaches her but Yamabuki Gozen dies of grief and shock before Ofude can do so. Ofude takes the boy's little coat from the body to use it as a clue for her future search for Komawakamaru, who she believes may have miraculously survived the attack, having been taken to safety by the boatman and his daughter by mistake. Ofude cuts off a bamboo in the thicket and from it makes an improvised cradle in which to lay the body of Yamabuki Gozen so that it may be carried away to the simple funeral rites which are all that now can be offered to her who was once of such high estate.